It was difficult to complete the blocks as I traveled. I've shared ideas and drawings, but tonight I got out the fabric and I share with you my ideas. 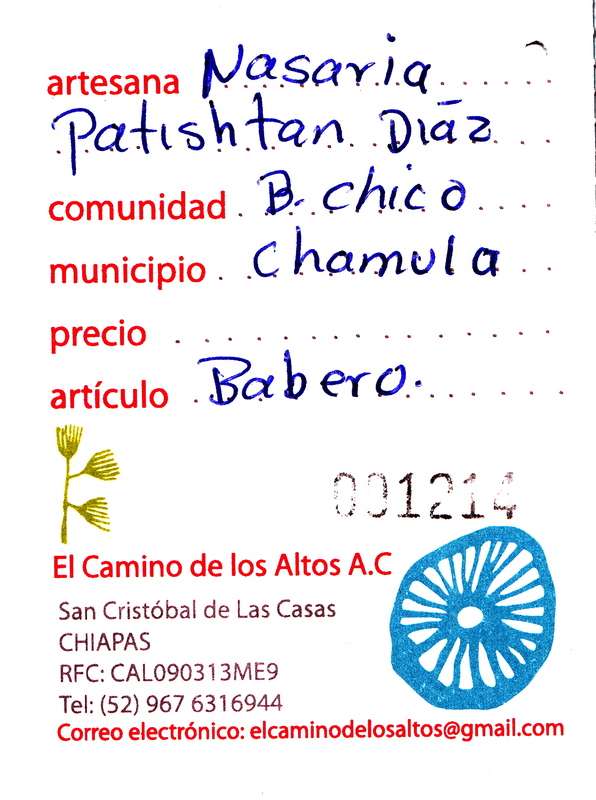 I purchased a child's bib made by the artesana Nasaria Patishtan Diaz from the municipio Chamular. So, my Spanish is not very good. 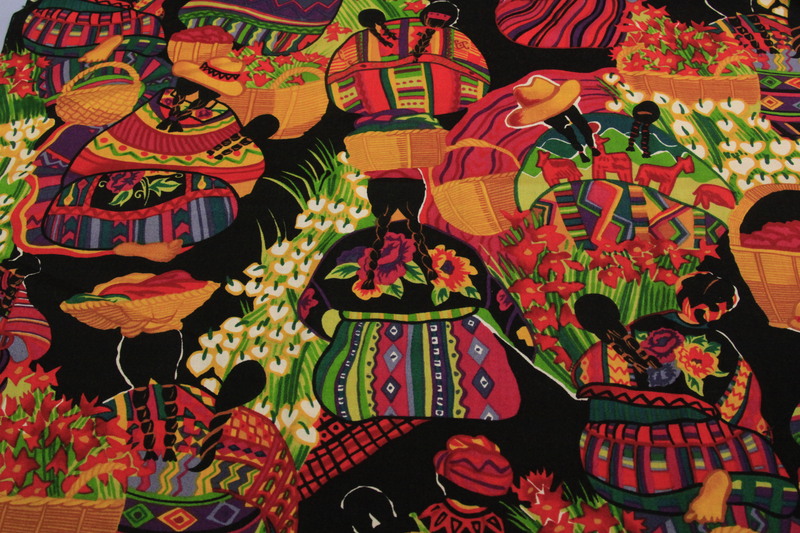 and I have been trying to find out more about the program under which this small garment was made. I will investigate further. 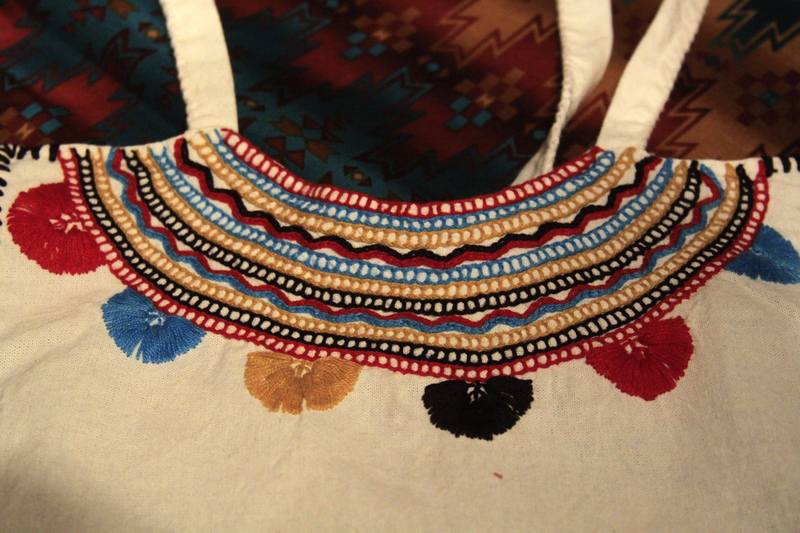 I bought the garment with the idea of using it in my challenge series on the last day of an exhibition at the Oaxaca Textile Museum. The garment is a hand embroidered baby bib (B. Chico) I'm choosing a pieced of fabric to applique it to, and then I will applique other images on the bib… in fact, these images were on a piece of fabric that contained candy, given to me as a gift. 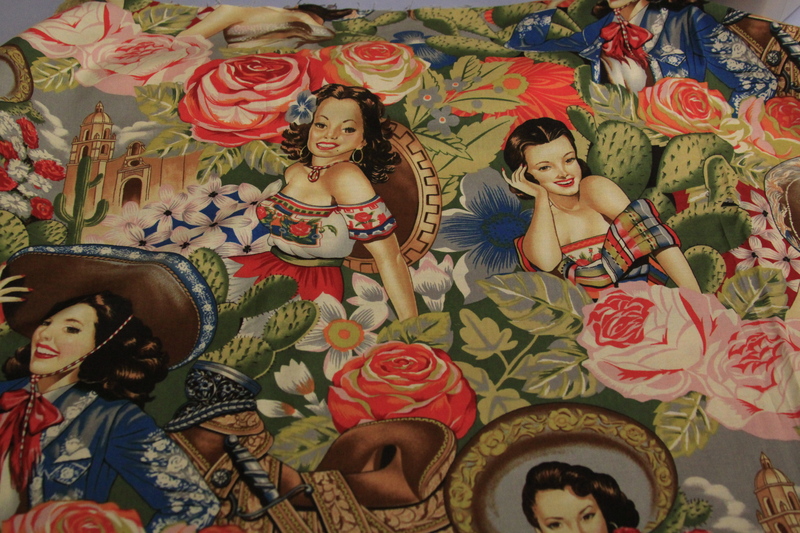 The following photos are of fabric I have in my stash to quilt the bib onto…. I love this one, but it's a little busy. This one is fabulous too, but I think I need to keep it for a specific purpose… like, applique lilies superimposed over the top……!!! maybe. 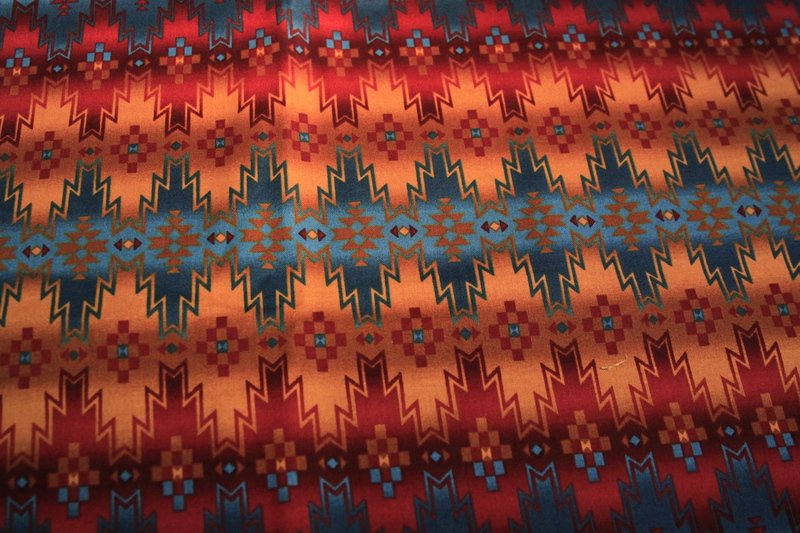 Somehow this fabric reminds me of the beautiful rugs I've just seen… the pattern is vertical and will balance with the rectangle bib which sits vertically. The images I'm appliqueing on are already on a white background so I put fusible web on the back of the fabric and cut around the perimeter of the pictures leaving just a little white on the edge… then I don't need to be absolutely exact when appliqueing..
More tomorrow, I'm not too sure where I go from here with this challenge… but I'm going to sleep on the idea. Oh boy Pammy fantastic pieces I am green with jealousy!! That bib. 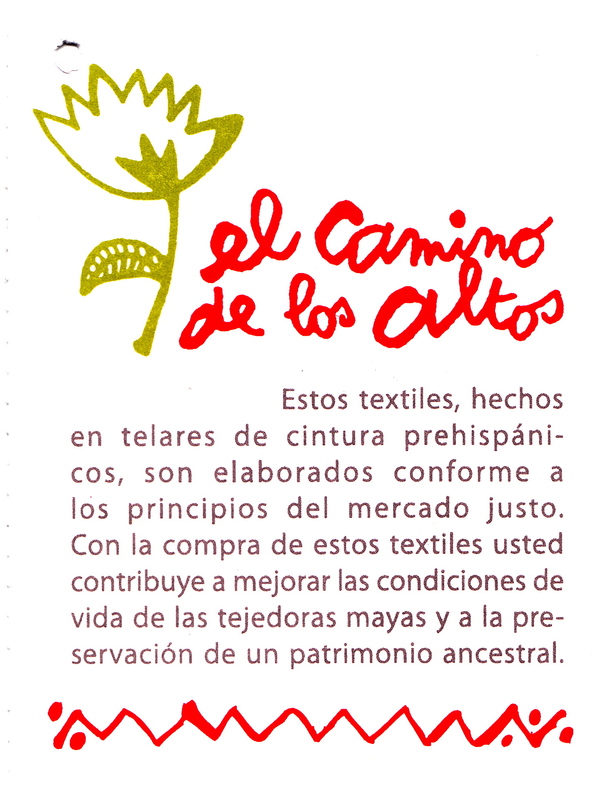 It says that it was made by Mayan indians using methods from Pre Spanish times and is sold under Fair Trade principals. (My Spanish is good? No it’s bing.com.) I can work out the stitching but those tassels. Do they sit on the surface or are the ends sewn through the fabric? 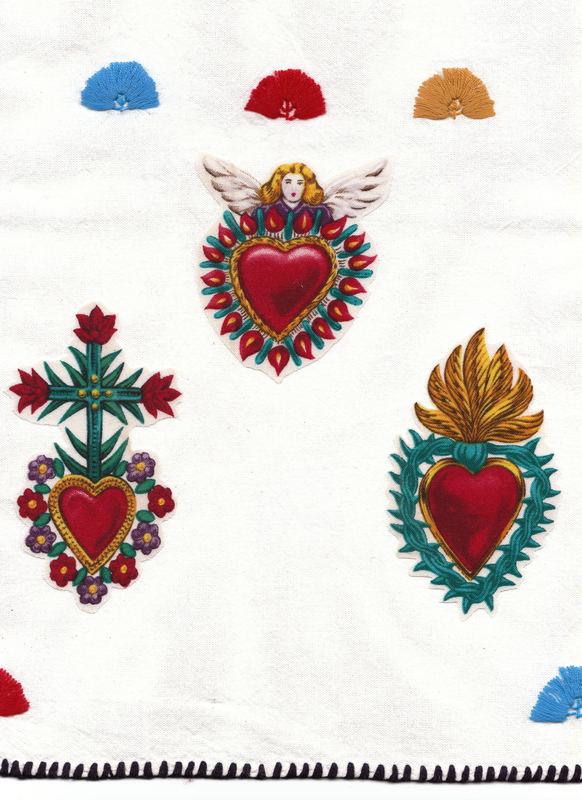 They are sewn through the fabric, so in essence they are embroidered on. Previous PostHome again, home again, jiggety jig. Next PostChallenge block No 10.